To Cite: Henry Joseph L, Hancharoenkul B, Sitilertpisan P, Pirunsan U, Paungmali A. Comparison of Effects Between Core Stability Training and Sports Massage Therapy Among Elite Weightlifters with Chronic Non-Specific Low Back Pain: A Randomized Cross-Over Study, Asian J Sports Med. 2018 ; 9(1):e58644. doi: 10.5812/asjsm.58644. Background: Lumbopelvic stability training (LPST) and massage therapy are common therapies used for pain reduction and management of low back pain. However, the effects of LPST and sports massage therapy (SMT) for management of chronic non-specific low back pain (CLBP) among elite weightlifters have never been studied before. Objectives: The current study investigates the therapeutic effects of LPST and SMT on pain intensity (PI), pain pressure threshold (PPT) and tissue blood flow (TBF) among elite weightlifters with CLBP. Methods: A total of 16 female athletes training for the international and Olympic weightlifting competitions participated in a randomized balanced cross-over study. The athletes were randomized into three sessions of LPST and SMT with a time interval of 24 hours within sessions and a wash out period of 4 weeks between the sessions. The PI, PPT and TBF were measured before and after each session repeatedly in both groups of interventions. The changes in the PI, PPT and TBF within and between the groups were analysed using repeated measures analysis of variance [ANOVA]. Results: The results demonstrated a reduction of PI (P = 0.01), increase in PPT (P = 0.01) and improvement of TBF (P = 0.01) among the participants in both groups of interventions. The SMT group showed a trend of greater therapeutic benefits when compared to LPST group especially in PI (P = 0.001). Conclusions: The findings suggest positive evidence on the therapeutic effects of LPST and SMT for management of CLBP among elite weightlifters with improvement in PI, PPT and TBF. Coaches, clinicians, and athletes may consider LPST and SMT as useful interventions for management of CLBP among elite weightlifters. Weightlifting was one of the physically demanding sports in the recent 2016 Olympics games at Rio de Janeiro, Brazil. A total of 8 World and 13 Olympic records were smashed by elite weightlifters at Rio de Janeiro2016, which makes weightlifting an extremely intense competition (1). In literature, weightlifting is referred to Olympic-style weightlifting but not power lifting, body building or general weight training; and elite weightlifters are professional athletes who train to compete in the weightlifting sport at Olympic level games (2). The high intensity, hard training regime and extreme physical performance of the sport may expose athletes to several musculoskeletal injuries (3, 4). The common body sites for injuries include lower back, knee and shoulder amongst which lower back region accounts for 40.8% to 64% of injuries among elite weightlifters (5, 6). Furthermore, dysfunctional core muscles of lumbopelvic region and impaired lumbopelvic stability are suggested as contributing factors for low back pain among athletes (7-10). Therefore, rehabilitation of back pain and optimal lumbopelvic stability are important issues to coaches and health care practitioners for injury prevention and management. In this regard, lumbopelvic stability training (LPST) and sports massage therapy (SMT) are some of the possibly useful treatments for management of CLBP. LPST and SMT are part of manual therapy techniques with different therapeutic effects (11-13). LPST improves core muscle thickness, increases spinal stability, restrains abnormal movements at lumbar spine, reduces lumbar pain and prevents injury of lumbopelvic region (14-16). On the other hand, SMT assists warming up of muscles, reduces muscle soreness, improves circulation, removes metabolic waste, and promotes relaxation (17-19). Although the positive benefits of LPST and SMT were documented in the literature, no scientific data exists on the comparison of the therapeutic effects between these two interventions among elite weightlifters with CLBP. Nevertheless, LPST and SMT are some of the common treatments discussed in clinical guidelines to treat CLBP in day to day practice (20). Thus, it is important to investigate the therapeutic effects between LPST and SMT among elite weightlifters with CLBP. Therefore, the main aim of the study was to compare the effects between the LPST and SMT on the pain intensity (PI), pain pressure threshold (PPT) and tissue blood flow (TBF) among elite female weightlifters with non-specific CLBP. The study hypothesises that both LPST and SMT improves PI, PPT and TBF among the elite weightlifters with CLBP. The study findings may assist coaches, sports scientists, clinicians, and athletes to understand the therapeutic effects between LPST and SMT, and thereby to make an informed decision on application of these techniques for management of CLBP among elite weightlifters. A total of 16 elite female weightlifters with CLBP who were training for International and Olympic level weightlifting competitions participated in the study. The mean age of the participants was 20.44 ± 3.14 years and they had been involved in weightlifting sports with a mean duration of 6.38 ± 2.31 years approximately. The study details were advertised to the population of weightlifters in the national weightlifting training camp through a notice board. Pre-defined inclusion and exclusion criteria were used to recruit the study participants. The participants had mild to moderate back pain for the past three months with a visual analog scale pain score value of between 2/10 - 7/10 cm and the location of pain was identified in the area between the 12thrib to gluteal folds. Any referred pain below gluteal fold or neurological involvement in lower limbs, history of past surgery, history of smoking and history of any back injury in the past 3 months were considered as exclusion criteria. Also, participants with menstruation, history of skin diseases over the trunk region and who were diagnosed having spinal stenosis were excluded. All participants were advised to refrain from any sort of medications, weightlifting training protocols, stimulant (e.g. caffeine) and alcohol consumption 12 hours prior to the study measurements. All participants were briefed about the study and written informed consent was collected prior to their participation in the study. A university ethical committee approved the human ethics for the study as per the standards of the Declaration of Helsinki, Finland. The effects of two groups of interventions; the LPST training and the SMT among the weightlifters with CLBP were investigated through a within subject repeated measures cross-over randomized allocation study design. Figure 1 shows the study cross over design with measurements. The cross-over design was employed in this study to avoid variations in the physical, physiological and psychosocial characteristics among the study participants. The two interventions were numerically coded in a sealed envelope and the participants were randomly allocated to any one of the two-intervention groups as per the concealed allocation method. Once allocated to the group, every participant received 3 sessions of intervention with a 24 hours interval between each session. After 4 weeks of wash out period, the participants were allocated to the other intervention group and thus the cross-over of the group was performed during the trial. A total of three different outcome measures were used in the study namely PI, PPT and TBF to understand the effects of LPST and SMT among the elite weightlifters. All the outcome measures were performed before and after each session repeatedly on both groups of interventions. A qualified physical therapist who was not a part of the research project measured all the outcome variables in the study. All the outcome measurements and the interventions were conducted in a controlled environmental room with a temperature of 24.5 ± 0.5°C and a relative humidity of 60 ± 5%. The outcome measures for the PI and PPT were collected as per the previously established protocols (21, 22). The Visual Analog Score (VAS) with a 10-cm indicator scale was used to assess the severity of the pain. The participants rated the pain intensity over the lumbosacral area on the VAS scale with ‘no pain’ on the left end of the scale and ‘maximum pain’ on the right end of the scale. A pressure algometer (Somedic Production, Algometer type II, Sweden) with a probe size of 1.0 cm2 was used to collect the pressure pain threshold. The PPT was measured in the unit of kilo Paskal (kPa). The calibration of the device was performed in the laboratory with a 100 kPa calibration weight prior to the collection of the PPT measure. The measure was collected over the two different body regions namely upper trapezius and the lumbar region at the most tender spot on a fixed point. To maintain consistency of the measures, the skin was first marked using a marker and the pressure pain measures were collected from the same point. The pressure was applied on the marked spots with an incremental increase at a rate of 40 kPa/sec until the applied stimulus was perceived as painful by the participants. The participants indicated the pain onset to the therapist by pressing the button and the pressure score was measured as PPT. A total of three measurements were taken and the mean value of the 3 trials was used for further analysis. The TBF over the tissue at the lumbar region was measured as per a previously established protocol (15, 22). A laser Doppler blood flow meter (Moor instruments DRT4, UK) was used to measure the TBF in flux/min with the participants in prone position. The most tender spot on the posterior aspect of lumbosacral region between the first and fifth lumbar spine was identified and marked to standardize the measurement site for each participant for every measure. The TBF was measured on the participants for every minute for a period of 5 minutes through the laser Doppler blood flow meter placed over the marked site. The mean value of the TBF was used for analysis. The LPST was performed as per an established protocol (15, 16, 21). A total of 3 days of LPST interventions were applied with an interval of 24 hours rest between each session. The LPST was performed in supine crook lying position with hip flexion and knee flexion in 70° and 90° respectively. A pressure biofeedback was placed beneath the lumbar spine between the levels of second lumbar spine and first sacral spine and the participants performed the abdominal hallowing manoeuvre over the pressure biofeedback unit that was inflated to 40 mmHg of air pressure. Table 1 explains the different exercises of lumbopelvic stability training with order of progression, frequency of application and the duration of administration of the training. The exercises are illustrated in Figure 2. The LPST was performed and progressed with contraction of the core stabilization muscles. The progression of exercise training was stopped if the participants lost the registered air pressure of 40 ± 10 mmHg in the pressure biofeedback unit. The participants were instructed to stop the exercises and to inform the therapist, if there was any increase of back pain during the training conditions. The SMT was administered with the participants positioned in prone position over a manual therapy bed with lower legs supported on the pillows. The SMT was performed on the back region extending from occiput to axillary lines and up to posterior iliac crest for a total duration of 20 minutes with moderate pressure on the tissues. The various techniques of SMT and duration of administration are explained in Table 2. The SMT as shown in Figure 3, was applied for a total of 3 days with an interval of 24 hours rest between each session. All interventions were performed by a qualified physical therapist as per the appointments by an earlier agreed schedule. Based on a pilot study, at least fifteen participants were required for the study when a G*power statistical program calculated the sample size with a significant alpha level of 0.05 and power analysis of 0.80 with an estimated effect size of 1.039 for the primary outcome of VAS. Thus, a total of 16 elite weightlifters with CLBP from the women’s National level elite weightlifting squad were recruited for the study. The data were analysed using statistical software package [SPSS] for windows version 20.0. The normalization of data was examined using Shapiro-Wilk test which showed normal distribution of the variables. The percentage change of the outcome variables was measured through calculating the difference between pre-and post-changes divided by hundred. The measured values of VAS, PPT and TBF within each group and between the groups were analysed using repeated measures analysis of variance [ANOVA]. A level of significance of P < 0.05 was set for all measures. In addition, to evaluate the assumption of repeated-measures crossover design for carryover effect and the time effects that each individual subject was the same between levels of the primary factor being investigated (i.e., SMT, and LPST), we conducted two sets of repeated measures ANOVAs on the pre-treatment data, with one ANOVA comparing differences among conditions (ie, SMT, and LPST) and the other ANOVA comparing differences among periods (i.e., 1st phase, and 2nd phase). The pre-treatment data for all outcome measures were not different between conditions (ie, SMT, and LPST) or between periods (i.e., 1st Phase, and 2nd Phase) suggesting no carryover and time effects of the repeated-measures crossover design with 4-week wash out period in this study (P > 0.05). All the participants completed the intervention protocols successfully in both the groups. The results show that there are significant changes in VAS (P < 0.01), PPT (P < 0.01) and TBF (P < 0.01) among participants in both LPST and SMT, however the trend of changes are higher in SMT group when compared to LPST. The measured scores of VAS, PPT and TBF and percentage changes (%Ch) within and between sessions among the participants in the LPST and SMT groups from day 1 until day 3 are shown in Table 3.
bSignificant differences between pre-post (P < 0.01). cLPST vs SM; P < 0.001). dSignificant differences between pre and post values between Day 1 and Day 2; P < 0.05). eSignificant differences between pre and post values between Day 1 and Day 3; P < 0.05). The current study investigated the effects of LPST and SMT among elite weightlifters with CLBP. 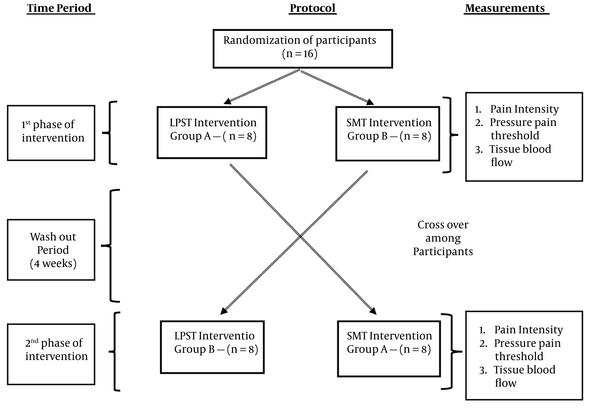 The findings supported the hypothesis that both LPST and SMT improved the PI, PPT and TBF, while the observed positive effects were greater in the SMT group when compared to the LPST group. The effects of common exercises such as plyometric, strength training and conditioning exercises are generally reported among elite weightlifters (23). To the knowledge of authors, no research has compared the effects of LPST and SMT among elite weightlifters with CLBP. In this regard, the current study may assist coaches, sports scientists, clinicians, and athletes to understand the effects of LPST and SMT among elite weightlifting athletes with CLBP. In order to accept efficacy of any intervention in clinical practice, the therapeutic effect on the clinical variables needs at least a 15% change in the pre- and post-test values (24, 25). The clinical effects of LPST and SMT in the current study were more than 15% of change for several variables ranging from 52.24% to 122.94% of increase in TBF, 12.08% to 35.10% of reduction in PI and 19.42% to 14.15% of improvement in PPT respectively. Evidence suggests that an increase in pain sensitivity in primary area of pain is an effect of peripheral sensitization, whereas an increased sensitivity in areas anatomically remote for the primary area of pain is an effect of the central sensitization phenomenon (26). Therefore in current study, the PPT was measured at two different sites both locally in the lumbar region and remotely over the upper trapezius muscle to understand the effect of changes in peripheral and central sensitization. Thus, a reduction in PPT over the lumbar region and upper trapezius possibly suggests that LPST and SMT may have both peripheral and central systemic effects on pain modulation. The clinical effects of the current study are supported by other manual therapy techniques such as posterior anterior mobilization techniques on lumbar spine and manual mobilizations techniques in knee joint as they all exhibit peripheral and central systemic effects on pain modulation (24, 27). Furthermore, recent evidence supports our study findings in which LPST has peripheral and central pain modulation effects among low back pain patients (21). Improvements in TBF and PI were noticed as significant effects after LPST and SMT among elite weightlifters with CLBP. The improvement in TBF was three to eight times higher in terms of clinical detect-able change which ranged between 52.24% and 122.94% approximately. The observed clinical effect is comparable with other past studies that have reported improvements in TBF and PI after LPST among CLBP (21, 22). Similarly, the effect of improvement in TBF after SMT was similar to a past study that reported increase in skin blood flow and blood volume to lumbar paraspinal muscles after massage (28). As SMT involves mechanical stimulation of soft tissues, the rubbing and mechanical pressure on soft tissues may have led to an increase in tissue blood flow by raising the arteriolar pressure (29, 30). The reduced PI observed among elite weightlifters may be related to the mechanical, biochemical and physiological effects of LPST and SMT (30-32). Multiple other mechanisms such as pain gate theory, diffuse noxious inhibitory control and stimulation of several analgesic pathways are other possible theories that may support reduced PI observed among elite weightlifters (32). The study has a few limitations. The current research investigated only the short-term effects of LPST and SMT and hence, the long-term benefits of LPST and SMT among the elite athletes need to be ascertained through further research. The study involved only elite female weightlifters which might limit the application of the study benefits to elite male weightlifters. Some confounding factors such as gender, level of motivation, anxiety and stress level may also influence the study outcomes (19, 31). A recent systematic review recommends clear guidance on several therapeutic determinants such as depth of application of massage on target tissues, treatment durations, and background of the massage practitioner and description of massage techniques to design an effective therapeutic protocol for massage therapy (33). The strength of the current study includes application of evidence based therapeutic techniques of SMT and hence, it may provide coaches and clinicians a clear protocol for practice. Although both LPST and SMT may provide therapeutic effects to athletes with CLBP, perhaps a combined intervention of LPST and SMT can be considered as a therapeutic package for the management of CLBP among athletes. However, the effects of the combined interventions of LPST and SMT is not known currently and hence, the effectiveness of the combined intervention needs to be ascertained using further studies. The LPST and SMT interventions are likely to provide therapeutic benefits by reducing PI, increasing PPT, and improving TBF among elite weightlifters with CLBP. In addition, the percentage change of PI, PPT and TBF occurs greater in the SMT intervention when compared to LPST. Coaches, health care practitioners and weightlifters may consider LPST and SMT as useful therapies in managing CLBP. Implication for health policy makers/practice/research/medical education: This research focuses on a unique sporting population of elite weightlifters and contributes to scientific evidence on therapeutic strategies to manage low back pain. As per our knowledge, this is the first research that evaluates the therapeutic effects of LPST and SMT in the management of low back pain among elite weightlifters. The study adds evidence based towards the applied practice of LPST and SMT for medical personnel, therapists, coaches and sports professionals who deal with elite weightlifting. 1. Wikipedia. List of Olympic records in weightlifting, From Wikipedia, the free encyclopaedia website 2017. 2017. Available from: https://en.wikipedia.org/wiki/ListofOlympicrecordsinweightlifting. 2. Calhoon G, Fry AC. Injury rates and profiles of elite competitive weightlifters. J Athl Train. 1999;34(3):232-8. [PubMed: 16558570]. 3. Eltoukhy M, Travascio F, Asfour S, Elmasry S, Heredia-Vargas H, Signorile J. Examination of a lumbar spine biomechanical model for assessing axial compression, shear, and bending moment using selected Olympic lifts. J Orthop. 2016;13(3):210-9. doi: 10.1016/j.jor.2015.04.002. [PubMed: 27408480]. 4. Aasa U, Svartholm I, Andersson F, Berglund L. Injuries among weightlifters and powerlifters: a systematic review. Br J Sports Med. 2017;51(4):211-9. doi: 10.1136/bjsports-2016-096037. [PubMed: 27707741]. 5. Siewe J, Rudat J, Rollinghoff M, Schlegel UJ, Eysel P, Michael JW. Injuries and overuse syndromes in powerlifting. Int J Sports Med. 2011;32(9):703-11. doi: 10.1055/s-0031-1277207. [PubMed: 21590644]. 6. Sitilertpisan P, Hides J, Stanton W, Paungmali A, Pirunsan U. Multifidus muscle size and symmetry among elite weightlifters. Phys Ther Sport. 2012;13(1):11-5. doi: 10.1016/j.ptsp.2011.04.005. [PubMed: 22261425]. 7. Abdelraouf OR, Abdel-Aziem AA. The Relationship between Core Endurance and Back Dysfunction in Collegiate Male Athletes with and without Nonspecific Low Back Pain. Int J Sports Phys Ther. 2016;11(3):337-44. [PubMed: 27274419]. 8. Hides JA, Boughen CL, Stanton WR, Strudwick MW, Wilson SJ. A magnetic resonance imaging investigation of the transversus abdominis muscle during drawing-in of the abdominal wall in elite Australian Football League players with and without low back pain. J Orthop Sports Phys Ther. 2010;40(1):4-10. doi: 10.2519/jospt.2010.3177. [PubMed: 20044702]. 9. Hyde J, Stanton WR, Hides JA. Abdominal muscle response to a simulated weight-bearing task by elite Australian Rules football players. Hum Mov Sci. 2012;31(1):129-38. doi: 10.1016/j.humov.2011.04.005. [PubMed: 21840078]. 10. Sitilertpisan P, Pirunsan U, Puangmali A, Ratanapinunchai J, Kiatwattanacharoen S, Neamin H, et al. Comparison of lateral abdominal muscle thickness between weightlifters and matched controls. Phys Ther Sport. 2011;12(4):171-4. doi: 10.1016/j.ptsp.2011.02.002. [PubMed: 22085710]. 11. Zazulak B, Cholewicki J, Reeves NP. Neuromuscular control of trunk stability: clinical implications for sports injury prevention. J Am Acad Orthop Surg. 2008;16(9):497-505. [PubMed: 18768707]. 12. Brummitt J. The role of massage in sports performance and rehabilitation: current evidence and future direction. N Am J Sports Phys Ther. 2008;3(1):7-21. [PubMed: 21509135]. 13. Zheng Z, Wang J, Gao Q, Hou J, Ma L, Jiang C, et al. Therapeutic evaluation of lumbar tender point deep massage for chronic non-specific low back pain. J Tradit Chin Med. 2012;32(4):534-7. [PubMed: 23427384]. 14. Hodges PW. Core stability exercise in chronic low back pain. Orthop Clin North Am. 2003;34(2):245-54. [PubMed: 12914264]. 15. Paungmali A, Henry LJ, Sitilertpisan P, Pirunsan U, Uthaikhup S. Improvements in tissue blood flow and lumbopelvic stability after lumbopelvic core stabilization training in patients with chronic non-specific low back pain. J Phys Ther Sci. 2016;28(2):635-40. doi: 10.1589/jpts.28.635. [PubMed: 27064327]. 16. Leonard JH, Paungmali A, Sitilertpisan P, Pirunsan U, Uthaikhup S. Changes in Transversus Abdominis Muscle Thickness after Lumbo-Pelvic Core Stabilization Training among Chronic Low Back Pain Individuals. Clin Ter. 2015;166(5):e312-6. doi: 10.7417/T.2015.1884. [PubMed: 26550815]. 17. Andersen LL, Jay K, Andersen CH, Jakobsen MD, Sundstrup E, Topp R, et al. Acute effects of massage or active exercise in relieving muscle soreness: randomized controlled trial. J Strength Cond Res. 2013;27(12):3352-9. doi: 10.1519/JSC.0b013e3182908610. [PubMed: 23524365]. 18. Nelson N. Delayed onset muscle soreness: is massage effective?. J Bodyw Mov Ther. 2013;17(4):475-82. doi: 10.1016/j.jbmt.2013.03.002. [PubMed: 24139006]. 19. Moraska A. Sports massage. A comprehensive review. J Sports Med Phys Fitness. 2005;45(3):370-80. [PubMed: 16230990]. 20. Bernstein IA, Malik Q, Carville S, Ward S. Low back pain and sciatica: summary of NICE guidance. BMJ. 2017;356. i6748. doi: 10.1136/bmj.i6748. [PubMed: 28062522]. 21. Paungmali A, Joseph LH, Sitilertpisan P, Pirunsan U, Uthaikhup S. Lumbopelvic Core Stabilization Exercise and Pain Modulation Among Individuals with Chronic Nonspecific Low Back Pain. Pain Pract. 2017;17(8):1008-14. doi: 10.1111/papr.12552. 22. Paungmali A, Sitilertpisan P, Taneyhill K, Pirunsan U, Uthaikhup S. Intrarater reliability of pain intensity, tissue blood flow, thermal pain threshold, pressure pain threshold and lumbo-pelvic stability tests in subjects with low back pain. Asian J Sports Med. 2012;3(1):8-14. [PubMed: 22461960]. 23. Selim Kaplan A. Effect of sport massage on pressure pain threshold and tolerance in athletes under eccentric exercise. Int J Sci Culture Sport. 2014;2(6):136. doi: 10.14486/ijscs185. 24. Moss P, Sluka K, Wright A. The initial effects of knee joint mobilization on osteoarthritic hyperalgesia. Man Ther. 2007;12(2):109-18. doi: 10.1016/j.math.2006.02.009. [PubMed: 16777467]. 25. Voogt L, de Vries J, Meeus M, Struyf F, Meuffels D, Nijs J. Analgesic effects of manual therapy in patients with musculoskeletal pain: a systematic review. Man Ther. 2015;20(2):250-6. doi: 10.1016/j.math.2014.09.001. [PubMed: 25282440]. 26. Scott D, Jull G, Sterling M. Widespread sensory hypersensitivity is a feature of chronic whiplash-associated disorder but not chronic idiopathic neck pain. Clin J Pain. 2005;21(2):175-81. [PubMed: 15722811]. 27. Krouwel O, Hebron C, Willett E. An investigation into the potential hypoalgesic effects of different amplitudes of PA mobilisations on the lumbar spine as measured by pressure pain thresholds (PPT). Man Ther. 2010;15(1):7-12. doi: 10.1016/j.math.2009.05.013. [PubMed: 19643656]. 28. Mori H, Ohsawa H, Tanaka TH, Taniwaki E, Leisman G, Nishijo K. Effect of massage on blood flow and muscle fatigue following isometric lumbar exercise. Med Sci Monit. 2004;10(5):CR173-8. [PubMed: 15114265]. 29. Weerapong P, Hume PA, Kolt GS. The mechanisms of massage and effects on performance, muscle recovery and injury prevention. Sports Med. 2005;35(3):235-56. [PubMed: 15730338]. 30. Zainuddin Z, Newton M, Sacco P, Nosaka K. Effects of massage on delayed-onset muscle soreness, swelling, and recovery of muscle function. J Athl Train. 2005;40(3):174-80. [PubMed: 16284637]. 31. Frey Law LA, Evans S, Knudtson J, Nus S, Scholl K, Sluka KA. Massage reduces pain perception and hyperalgesia in experimental muscle pain: a randomized, controlled trial. J Pain. 2008;9(8):714-21. doi: 10.1016/j.jpain.2008.03.009. [PubMed: 18455480]. 32. Gay CW, Alappattu MJ, Coronado RA, Horn ME, Bishop MD. Effect of a single session of muscle-biased therapy on pain sensitivity: a systematic review and meta-analysis of randomized controlled trials. J Pain Res. 2013;6:7-22. doi: 10.2147/JPR.S37272. [PubMed: 23403507]. 33. Bervoets DC, Luijsterburg PA, Alessie JJ, Buijs MJ, Verhagen AP. Massage therapy has short-term benefits for people with common musculoskeletal disorders compared to no treatment: a systematic review. J Physiother. 2015;61(3):106-16. doi: 10.1016/j.jphys.2015.05.018. [PubMed: 26093806].